The Fiji Flag was officially adopted on October 10th, 1970 and is a light blue flag that has the Union Jack flag in the left corner and the Fijan Shield on the right-hand side. The Fijan Shield consists of a yellow lion that is holding a cocoa pod in its paws and below the lion is a white field that has been divided into four parts by the St. George Cross. Each quarter of the cross represents different things which include: stalks of sugarcane, coconut palm trees, bananas, and a white dove. 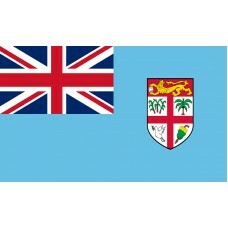 The light blue color of the flag represents the Pacific Ocean, the Union Jack is symbolic of the relationship that Fiji had with the United Kingdom, the yellow lion symbolizes the strength of the island, and the quarters of the shield each represent the country's agriculture and natural resources. The white dove is representing the peace. The Fijan Flag was designed by Tessa Mackenzie and Robi Wilcock after they both won the competition to design the flag, both entering identical designs. It was first raised at Albert Park on October 10th, 1970. Fiji is an island country in Melanesia in the Pacific Ocean. The Pacific Ocean is very symbolic and important for the natives of Fiji as it represents a big part of their economy particularly the fishing industry and the tourism. It is an island country that consists of 322 islands and 500 islets. Only 110 of the islands are inhabited. The two main islands of the country are Vita Levau and Vanua Levu. The majority of the population lives on one of these two islands and the capital of Fiji, called "Suva" can be found on the island of Vita Levau. The city that is home to the majority of people, is called, "Nadi." The first Europeans to land in Fiji were shipwrecked sailors and in 1874 Fiji became a British colony and was ruled by the British for 96 years. It was during the time of the British Colony relationship that the major cultivation of sugar cane began and the British brought a lot of Indian contractors to Fiji to work. In 1970 Fiji gained independence from the British commonwealth. Fiji is a very beautiful country and a major tourist attraction, especially for honeymooners. The land that makes up fiji was formed 150 million years ago due to volcanic activity and the country is now famous for its enchanting, white, sandy beaches. It is one of the most developed island countries in the Pacific Ocean due to the economy which is mainly reliant on tourism and sugar. Fiji is sometimes referred to as the "soft coral capital of the world" due to the 4000 square miles of coral reef that it covers. It is home to the "Beqa Lagoon" which is renowned for the coral reefs, as well as "Shark Reef," which is said to be the world's best shark dive, where one can see up to 8 different species of sharks. Another main attraction is the "Sigatoka Sand Dunes National Park" which is home to an amazing dune system in addition to Figi offering a plethora of archaeological history.